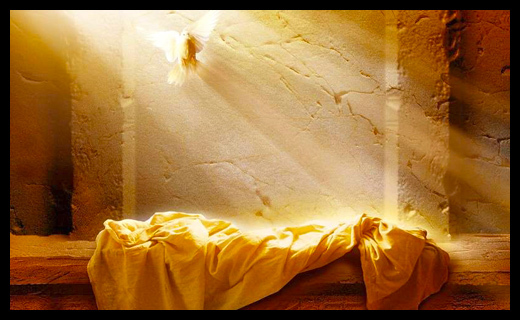 Jesus’ resurrection changed the course of human history. It was the most important event that has ever occurred. But its impact began with a relatively small group of people, whose entirely outlook on life changed when they saw Jesus alive after he had died. Christianity is more than just a philosophy or a way to live your life. The Gospel is more than simply a theory about the universe and humanity, or an idea to guide you in your actions. It is more than a set of values to live by. The Gospel is news – it is a report about a factual event, and all the implications that flow from the reality of that event. And at the center of that event is a man. Six hours had passed with Jesus hanging on the cross. Prior to that he’d gone through somewhere between nine and twelve hours of trial, abuse, beating, whippings, floggings. And he went through the greatest of all sufferings – complete abandonment of the loving presence of his Father, the God of heaven. “Knowing that everything had now been finished, and so that Scripture would be fulfilled, Jesus said, ‘I am thirsty.’ A jar of wine vinegar was there, so they soaked a sponge in it, put the sponge on a stalk of the hyssop plant, and lifted it to Jesus’ lips. When he had received the drink, Jesus said, ‘It is finished.’ With that, he bowed his head and gave up his spirit” (John 19:28-30). It is finished. A small phrase. A single word in the Greek text of the book of John. Tetelestai. Complete. Paid in full. Done forever. Accomplished. Jesus had carried the weight of sin on his shoulders. The sinless Son of God had become the ultimate sinner on our behalf, and walked under the relentless gaze of his Father’s justice. He faced the unmitigated terror of earthly government and some of the worst forms of punishment it had ever devised. Finally, he had felt the burning, holy wrath of God poured out on him in all its terrible purity. God’s anger was satisfied. Justice was met. The price had been paid. The power of sin was broken. Satan and all his demons disarmed forever. Mercy triumphed over judgment. Salvation had been won. Those words of Jesus signaled that God’s great plan of salvation was complete, and that he had made the atonement needed to restore the relationship between God and man. That he had made atonement for me. That there is nothing I need to do to be right with God, because it is already done. The fact of Jesus’ resurrection seals the truth of these words. Every man dies. But to say, “I’m going to die, and then I’m going to come back.” That was new. No one had done that before. No one has done it since. And by doing it, Jesus proved the truth of everything he said. Everything he said about me – that I am a sinner in desperate need of salvation, that God’s standard is perfection and that I don’t meet it, that I can only live by him – is true. Everything he said about himself – that he is the Son of God, that he is the prophesied Messiah, that he is the Savior from sin – is true. Everything he said about his death – that it brings release for the prisoners and healing for the sins of all – is true. When he said, “It is finished,” it is true. Because Jesus rose from the dead. Today is Easter Sunday, but for many people in the world – and even our country – it is just another Sunday. Maybe they are getting together with family, maybe they are exchanging baskets of gifts or watching the kids go hunting for eggs. But in the grand scheme of their year it isn’t all that big of a deal. But for Christians it is another story altogether. We gathered in droves this morning to celebrate our Risen Savior! We put on our best Sunday clothes, we smiled and hugged one another and wished everyone we could a “Happy Easter” because we are filled with joy today. We rose early for sunrise services and joined in fellowship over Easter breakfast, we sang hymns with full hearts and full voices. Our musicians gave their best to add to our worship, to give our best to Jesus, who died for us, and rose from the dead. It is quite a lot of effort… for just another Sunday. Because, after all, that’s all it is.